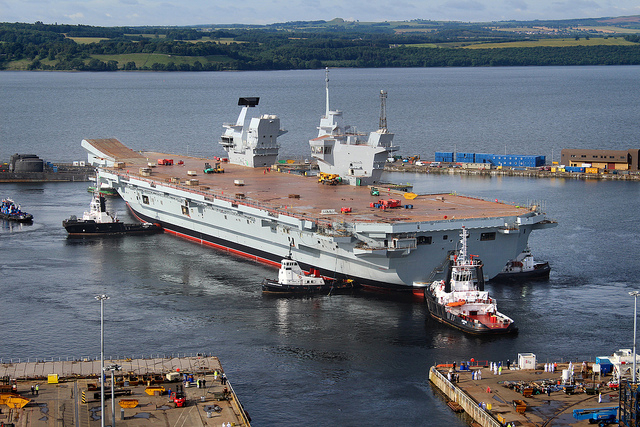 My last blog was written just as HMS Queen Elizabeth had floated out of the build dock and was about to be moored in the non-tidal basin at Rosyth. Quite a lot has happened during the months that followed. The Naval Architects have carried out the incline experiment that allows us to determine the displacement (weight) and the location of the centre of gravity of the ship and will be the basis on which all future management of weight and stability will be based. The weight estimate was confirmed to within 0.5% of measured values and the centre of gravity longitudinally, transversely and vertically have also been found to be within expectations. This is an excellent result and gives us great confidence that the aircraft carrier will behave as expected when at sea. With the huge ship safely moored at J/K berth in the non-tidal basin, services have been reinstated, access towers erected, workshops on board and on the quayside have been established and the centre of gravity of the workforce has moved from the build dock to the outfit and commissioning berth. There has been a very welcome upturn in the rate at which pipe systems have been pressure tested, system flushing undertaken and preparations made to embark fuel for the first time. Meanwhile, the electricians are progressing in pulling and terminating cables and check wiring the installation. The plastic ducting for the fibre optics that make up the ship’s networks is being installed and “blowing” of the glass fibres along the ducting using compressed air is progressing well. The next major milestone for the Queen Elizabeth team is the energising of the High Voltage system from the 11kV shore supply, which will allow the ship’s propulsion system and power generation and distribution systems to be progressively set to work. The preparations and safety procedures for ‘HV live’ have been completed, the shore connections are being finalised and HV live is confidently anticipated in the next few weeks. The programme will then continue through first running of the ship’s diesel generators early next year. This will include the first turning of shafts against the resistance of the brake propeller blades, the running of the gas turbine generators and progressively working up to full power trials alongside. The brake propeller blades are able to absorb about half the 80Mw of the ship’s main propulsion motors with the remaining power planned to be absorbed through an electrical load bank ashore. It will be quite something when full load is being absorbed! The future plan then works up to: ship staff move on board in 2016; sea trials and delivery to the Royal Navy in 2017; all leading to the ultimate goal of flying trials with fast jets in 2018 and initial operating capability in 2020. There remains much to be done. The aviation facilities of the ship are also progressing with installation of the hangar doors, setting to work of the aircraft lifts, installation of the Flyco windows and completing installation of the take off ramp all underway. Work to reinstate the facilities needed for the operation of STOVL aircraft is ongoing, including modified flight deck landing lights and aids, provision for the Precision Approach Radar, mission rehearsal training provision and enhanced security arrangements in key mission planning spaces. Of particular interest is the work to provide a heat resistant coating for the flight deck, while also providing the required coefficient of friction and being the expected colour and having the required flight deck markings. The F35B – the STOVL variant of the Joint Strike Fighter – that will be embarked on the carriers is very different to the Sea Harrier aircraft that naval aviation in the UK has been based on in recent years. In comparison the F35B is larger, heavier, with a much increased payload and is capable of Mach 1.6. The installed power in the jet is much larger than the Harrier and when directed downwards onto the deck during a vertical landing, the temperature and pressure of the jet exhaust plume is capable of removing conventional flight deck paint systems. After extensive research using amongst others the facilities of the hot gas laboratory at BAE Systems Warton, a Thermal Metal Spray coating developed with Monitor Coatings Ltd near Newcastle has been developed. This coating system has been applied to limited areas of the flight deck with work now ongoing to establish the process and procedures to apply it cost effectively to the entire four and a half acres of flight deck. All this through a Scottish winter and with the ship moored in a quite exposed location! While the HMS Queen Elizabeth team are working on commissioning and setting to work, the second ship, HMS Prince of Wales, has rapidly become a reality in Rosyth. Lower Block 03 (LB03), the first of the large blocks to make up the second ship, arrived by barge at Rosyth in July and was floated off and moored in the non-tidal basin in the next tidal window after HMS Queen Elizabeth float off. In September, Lower Block 02 (LB02) of HMS Prince of Wales arrived at Rosyth from Portsmouth. This was a bitter sweet moment as it, together with LB03, was docked down into the build dock as it marked the start of the assembly phase for HMS Prince of Wales but also the finish of shipbuilding at Portsmouth. Both blocks are in a very good state of completion and should allow the assembly phase to progress well at Rosyth. The lower section of the bow VB01 and the first of the centre blocks completing block 03 up to the flight deck level have now been installed using the Goliath crane. It’s now very clear that we have two aircraft carriers taking shape at Rosyth and therefore the Aircraft Carrier Alliance team has organised itself into two delivery teams concentrating in delivering the nation’s two flagships. I’ll update you on further progress soon. Once again, we are treated to a solid description of the inter-reaction and complexity of the various systems and procedures that these incredible vessels require to be constructed and prepared for use. I can only and once again express the hope that these skills -joint and several- will not be lost to our Nation: and will be available for the construction of revenue-earning as opposed to revenue-using (wasting?) ships: ships to help generate the income to pay for this example of mis-use of assets., Or are we just going to borrow more? Another blogger opined that we will soon be the best defended bankrupt nation in the world.. So another First! for GB plc. I hope these videos inspire a new generation to get involved in the STEM subjects and become our Engineers and Designers of the future. So, _two_ ‘Prince of Wales’ under construction. It looks as if the one with wheels will be built rather more expeditiously – for very good reasons – that its shed mate ‘Tornado’, so how about a length of track along the flight desk? With VERY substantial buffer stops at each end. Would the deck take it? And maybe even a ‘Tornado’ aircraft or two, expected to be in service until 2025, to make it a really good party? Great to see why there is no money for “costly” outdoor swimming pools in our cities. I don’t think it is too late for Britain to change her mind about the F 35B. In the interim, acquire Harriers and complete PoW as a catapult and arrestor wire carrier. A fine naval fighter such as the Super Hornet or Rafale would serve just as well. The advantage stealth features may seem to bring to the table will be soon negated with improving radars and intelligent use of existing radars. A bird sized signature will not be ignored. If a ‘bird’ is on an angle of attack, it will be shot down. I think there is too much obssession with stealth when it isn’t necessary or reasonable. The Ruritanian Navy still hasn’t got its “Ludicrous” class Aircraftless Carriers!! WHO got -and is getting-the “brown envelopes”?